If the webpage doesn't give you a solution, there maybe a few positions which cause the algorithm to bust. Some few cases (currently 15555 in 3857961 tries) takes too long to solve and will timeout. To get your cube back to original from any error, just give it a few more random turns and try again. 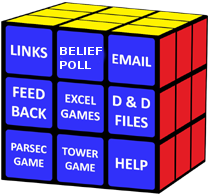 If you continue to get errors, it is also possible that your cube has become unsolvable. The cube can get it's corners mixed up pretty easy, and if you search "unsolvable rubiks cube" you may see pranks just to fluster people. Here is a link to repair your cube if this is the case. I get a lot of requests for 4x4 and 2x2 solvers and I investigated what it would take to add them. I have started a Kickstarter to fund the development of a 4x4 solver and add it to the site for free use. I get a lot of emails asking about the algorithm I use for this website. I used to just direct you to wrongway.org where there was a lot of good source code. Eric Dietz, was that site's owner but passed away in 2013 and the site is now down. I was able to pull the information from the Wayback machine. I am going to add links and store the files on my server so that the source code is still available for you to experiment with. They are programmed in the C++ language.